Miki follows Chiaki throughout the store, unable to believe that Chiaki is nonchalantly stealing. Chiaki turns and sees Miki. Uh-oh, the secret is out? What will Chiaki do? While we ponder that, we go over to Tachibana and Nakahara. Tachibana feigns surprise at meeting Nakahara outside of his apartment building. She tells him that she has moved in across the street. That girl gives me the willies. Back to Miki and Chiaki. Chiaki throws herself at Miki’s mercy. Miki asks why Chiaki shoplifts, but Chiaki makes no reply. Miki then tells her that she won’t tell anyone about the shoplifting incident. Miki then makes Chiaki promise never to do it again. Chiaki agrees to this and Miki goes for home with Chiaki glaring after her. Probably wondering if Miki will really keep her word or not. When Miki gets home, she is surprised to see her little sister waiting for her. Apparently Ai’s test went well and she was released from the hospital to wait at home until the surgery. Ai cooks Miki dinner and tells her that she wants to get a part time job. Miki asks why and Ai says she wants to help cover the surgery costs. Miki tells her not to worry and Ai says she wants to be like Miki, graduate from college and get a good job. She is envious because she thinks her sister has such wonderful days. If Ai only knew the truth. Miki doesn’t try to dissuade her sister of this idea, not wanting to worry her. Later that night, Miki does research about different products the company distributes. She wants to try hard and keep being a role model to her little sister. When Miki gets to work, she is met by the uncomfortable stares of her coworkers and Sano immediately calls her into the office and asks her what this is all about, thrusting papers at her. Apparently “this” is in reference to a blog that one of the coworkers found. They all believe the author of the blog to be Miki as it is pretty obviously referencing AOI and Miki’s fellow coworkers. Miki denies writing the blog, but no one believes her. They quote all the passages describing each of the workers. They are all incredibly displeased. Chiaki goes up to Miki and says she obviously doesn’t belong there. Poor Miki, if its not one thing it’s another. Is this Chiaki’s way of ensuring Miki won’t tell about the shoplifting? Miki runs out and Tachibana goes to comfort her. Meanwhile, Sano brings the printouts from the blog to Kirino, asking him to interfere. Kirino says the blog is vicious and Sano says she will write a formal report to personnel and have the coworkers right statements complaining about Miki. Kirino asks where is the proof, making Sano mad. As the blog lists no reals names or the name of the author, they cannot fire Miki. Sano is upset that this will go unpunished and asks why Kirino is defending Miki as he doesn’t know her. Kirino counters Sano by asking how much she actually knows about Miki herself. He then says she is too uptight and doesn’t notice what goes on and that’s why she has problems with her subordinates (this is echoed again by another boss, really making Sano upset and near hysterical, which is really annoying). Chiaki gets ready to leave and Sano demands to know where she is going. Chiaki replies that she is going to check on the olive oil displays. Sano tells Chiaki to take Miki, which Chiaki definitely doesn’t want. She tells Miki to go shopping or something, while Chiaki goes and checks the displays. Miki doesn’t listen and keeps following her. Meanwhile Bando comes back from overseas. He’s the presiding chief of consumer goods. He and Kirino are close and go up to the roof for a smoke. Bando says he worries about Kirino, as the company still takes valuable employees from the front lines and sticks them in the background. Kirino thanks Bando for all of his help and Bando says that he made it there on his own ability. Touching. While this scene is going on, Nakahara is called into Deputy Chief Anzai’s office who tells him that there is a huge problem. AOI is only supposed to be using organic, pure ingredients, but apparently the soybeans brought in from the U.S. have been genetically altered and to further complicate things, they have already been given to three top companies for soy sauce and tofu. Nakahara is told that Bando will more than likely be the one who will take the blame for this mistake. Nakahara is unhappy to hear this. Apparently he looks up to Bando as well. Anzai then says that to prevent such a scandal from getting out, he wants the certificate of quality in his hands. Something definitely smells fishy here. Chiaki and Miki make it to the store and Chiaki begins checking out the display. She is annoyed that Miki followed her and is watching how she does things. Chiaki forgets about her annoyance when she realizes the olive oil is placed on the bottom shelf versus being placed eye level like they agreed upon. She calls out the manager of the store whom she yells at. The manager says that no one is interested in such high price products. Miki breaks in and Chiaki tries to silence her, but Miki continues. She says that she wondered why the price was so high herself, but then when she did some research, she understood why. The manager refused to listen and walked out on the two. Afterward, Chiaki notices a notebooks of Miki’s and becomes curious. On the bus ride back to the office, Chiaki goes to sit with Miki and asks to see the notebook. Miki hands it over and you can see Chiaki’s surprise at Miki’s thorough research of the olive oil (among other things). When they get back to the office, the coworkers tell Chiaki that Sano has invited them all out for drinks after work in order to try to make their work atmosphere better. Chiaki declines and calls Miki to come with her. This surprises Miki, but she follows Chiaki to a conference room where she overhears Chiaki apologizing to the store manager for her assumptions and rudeness and asks for another chance for the olive oil campaign. She then gives Miki her notebook back and asks for help to make an advertising campaign based on Miki’s research. Miki is shocked and happy to hear that Chiaki wants to use the information she painstakingly gathered. The two get to work making fliers, leaflets, and they even cook with the olive oil so they have examples of foods. Chaiki and Miki have a lot of fun and begin to start bonding over this experience. At last! Something that has nothing to do with backstabbing or personal gain. Nakahara is conflicted. He doesn’t know what he should do. Should he get the certificate for Anzai? Or should he let it go and have the company face possible exposure for selling inorganic produce? Nakahara flashes back to Anzai tell him that Bando was aware of the situation, but proceeded anyways and is ignoring the problem this could pose to AOI. Nakahara calls his colleague who is in a business meeting, hoping to ask for his help. Unable to talk to someone about the problem, Nakahara comes to a decision and rushes up to Miki’s International Food department. 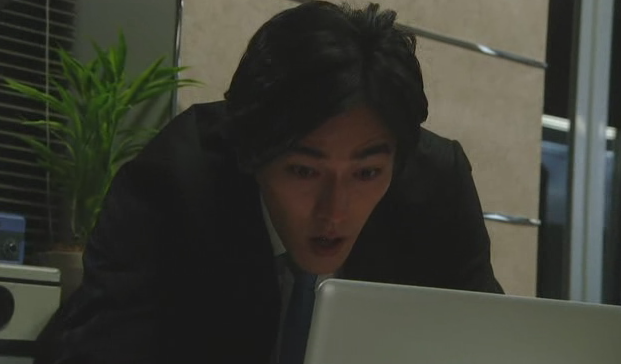 He finds Miki’s password and logs onto her computer. He finds the documents needed and copies them to his thumbdrive. While he is copying them, Miki’s male coworkers come in and see Nakahara. He tells them that his computer is down and he came to borrow one of theirs. They reply that he needs a password for that. 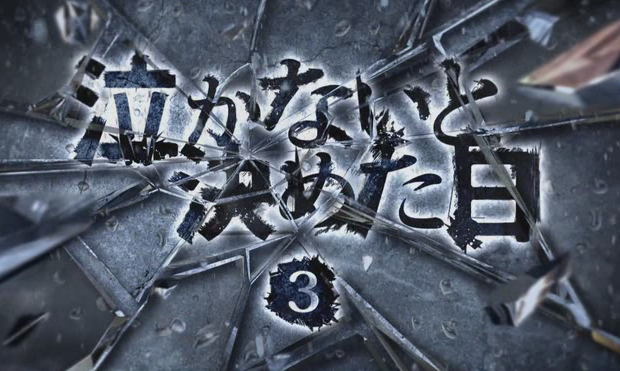 Nakahara looks at the screen and the download had completed and returned to the log on screen, saving him. The others check it out and he apologizes for being so silly (He is so nervous it is pathetic, they should have known something wasn’t quite right). He rushes out bumping into Kirino and dropping the thumbdrive. Kirino goes to pick it up, but Nakahara quickly grabs it and rushes away. No, that wasn’t suspicious at all. On his way out, Nakahara bumps into Miki and tells her that was the highlight of his day. Miki says the same and they go out to dinner where Miki tells him that she is hanging in by repeating his advice “it can’t all be done in a day” and this touches Nakahara, but he is still feeling badly about what he did. Miki asks him what’s wrong, but he doesn’t reply. On the way home, Nakahara tells Miki to call on him anytime when something bad happens and she needs help. Miki agrees to this and Nakahara tells her point plank that he intends of being with her forever. Sorry, that kind of creeps me out as he hasn’t known his beloved Kyuu-chan for long and is already saying he wants to be with her always. They do share a very tender kiss and then continue on their way home where they bump into Ai who was coming home from her part time job. After Nakahara leaves, Ai again says she is jealous of her sister’s luck of a good job and now a great boyfriend. Poor Ai was thinking about the boy she liked again. I don’t know if he isn’t talking to her or if she is just worried about not being able to see him so that means he can forget about her. It’s unclear as of now. Nakahara goes home where Tachibana awaits him. The girl is primping and using her mirror to see if he’s approaching. Nakahara sees her and she tells him that she has already lost her new apartment’s keys and that the landlord said it will take two hours to get new ones. She then asks about a restaurant she can wait at and he replies there is none around there (as it is already late) that would be able to help. Tachibana then says she will just go wait at the park. She smirks to herself when Nakahara comes a few minutes later with food for her and says he will wait with her in the parks as it isn’t safe for a woman to be alone that late at night. Tachibana then tells him that she is jealous that Miki has such a good boyfriend. If I was Nakahara, my creepy senses would be going off. That girl is just plain weird and seems to give off a not good vibe, but Nakahara doesn’t really seem to get this . . . or anyone else at the office for that matter. She has them snowballed. Miki happily recalls her great time working with Chiaki. The other coworkers and Sano part ways. The coworkers were unhappy with how badly Sano tried to force a cheerful atmosphere, which really killed the evening. Sano goes and starts piling up alcohol bottles. Apparently she plans on going on a bender after such a bad day. Well, we already knew she had an alcohol problem. 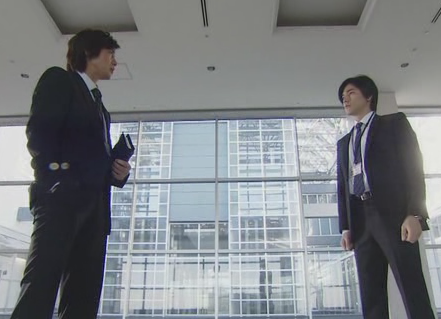 The next day Nakahara gives the documents to Anzai who says they will drastically change personnel. This surprises and worries Nakahara. Uh, I so could see this coming. He was so duped by Anzai into getting the evidence about the soybean problem so that Anzai could try to get rid of Bando. Are all major companies filled with such horrible politics? If so, count me out. Miki and Chiaki present their plan to the store manager and he agrees to try it out. He and his workers begin the advertising campaign while Miki and Chiaki watch. Miki is so pleased when people start picking up bottles of the olive oil and Chiaki is happy to see Miki’s happiness at their solving the problem and selling the olive oil. At lunch afterwards, Chiaki opens up to Miki and tells her that she is happy to be working on a project with someone again versus competing and backstabbing. She then tells Miki that she shoplifts because she is lonely and has no one to talk to. Miki tells Chiaki that she is working hard and persevering in order to support her family. It is nice to see Miki finally making friends and getting to see the good sides of her coworkers at last (who knew they had any?). Chiaki then says that she thinks Miki might be the one to finally be able to understand her and they agree to become friends. Things take a bad twist when we see Tachibana has overheard their entire conversation. What will the conniving woman do next? Miki and Chiaki go back to the office where the coworkers are cold towards Miki again, but they won’t tell what is going on. There is a moment when everyone leaves the office and then comes back and the worker who sits next to Miki is missing her wallet which she left sitting on her desk. She accuses Miki of stealing it because liars beget thievery. Whatever. Chiaki stands up for Miki and then they let the bomb drop. Apparently there is a new blog entry in which Miki tells about Chiaki’s “sticky fingers.” Uh-oh. Chiaki remains silent, unable to believe such a things, but then some one reads the blog post. Well, there goes that relationship. They dump Miki’s bag and there is the wallet. Sano goes balistic and grabs Miki telling her to just quit already and save them the headache. Even Chiaki begins telling Miki that. Ouch. Poor Miki almost collapses and then runs out to look for Nakahara. While she is running around we see Tachibana crouching in the bathroom with her laptop. She is the blog writer! She then blogs that she has reached her limit and will quit soon (well, Miki, not Tachibana). She is such an evil witch. But poor Nakahara has his own problems. He runs into Bando whom he asks about the soybeans from America. Bando wants to know if there is something wrong with them. Poor Nakahara is stunned. Bando didn’t know. He then recalls what Anzai said about throwing things into a tailspin and goes to find him, only thing is he went out and didn’t say when he’d be back. Nakahara is upset and doesn’t know what to do. He runs into Kirino who says that they can overcome this and that it is nobody’s fault. The problem is if it was done deliberately and then leaked to the media, then there will be big problems. Uh-oh. Nakahara has realized too late that Anzai has done this deliberately. While he was talking with Kirino, Nakahara ignored several of Miki’s calls. Not good. Unable to get in touch with Nakahara, Miki runs out of the office where she sits on the stairs in front of the building and cries. She needs to be strong for her family, she needs to face such things head on, but she doesn’t know if she has the strength or determination anymore since things are so hard. When she goes into the empty office, she sees a letter of resignation on her desk awaiting her signature. When she looks at her computer screensaver, she notices the word “Disappear!” has been written across the screen. She picks up the pen and pauses. She doesn’t know what to do, she is already at her limit. Meanwhile, coworker Tazawa is in the bathroom with a laptop too. He is scrolling through video footage from earlier in the day and he is shocked when he sees that Tachibana came in and put the wallet in Miki’s bag. At last the witch is caught! But will Tazawa do anything? My thoughts: This is a good series, but very frustrating. For every little progress Miki manages to make, she always faces a setback that throws her even further down the rabbit hole with little chance of being able to claw her way up and redeem her dirtied reputation. And what is up with Tachibana. In the first episode she says she always gets what she wants, but Miki has never been in her way (unless you count Nakahara), so why does Tachibana see fit to personally slaughter Miki and her career? It just doesn’t make sense. Too much infighting and backstabbing going on. Too much overreacting pushing the blame as well. Talk about painting work as the seventh circle of hell. With coworkers and friends like that, you definitely can’t afford enemies.